Today, is the biggest day for America in at least four years some would say. We (will hopefully) know tonight who will be the next President of the United States for four years and possibly eight. In one corner is a media mogul who represents “outsiders” hungry for change in America, Donald Trump. In the other corner is an insider who represents continuity (with some changes), Hillary Clinton. This election (so the pundits say) has been the most nasty in recent history and many seem to be voting for the candidate they like least. On that front, Gary Johnson is polling a couple of points, Jill Stein has a few, and Evan Mcmullin who seemed to come out of nowhere has a very decent chance at winning ultra-red Mormon country, Utah. 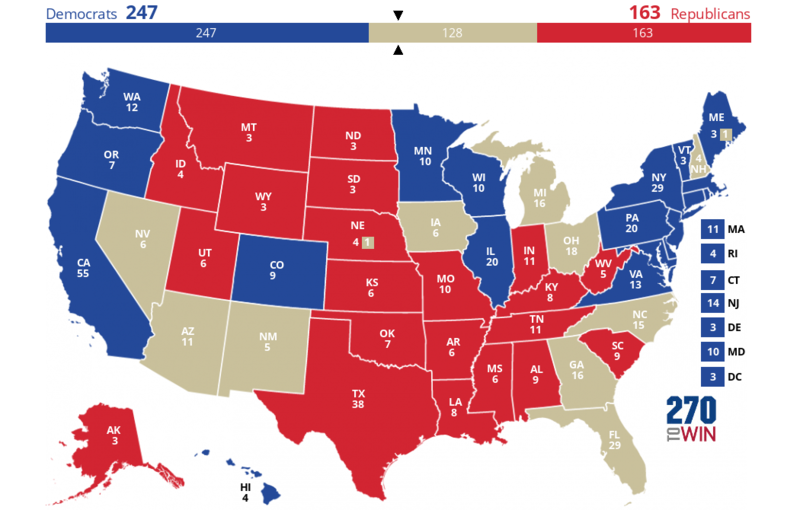 Otherwise, most pundits expect Hillary Clinton to win although if Donald Trump has good turnout he could win some contested states and some light blue states. We will be providing live coverage as it comes out. In terms of what time we will know a winner? It is hard to answer – see our short video below on which states you want to watch. Also, it is important to watch some ballot initiatives like Proposition 61 in California on Marijuana and even more importantly who controls the Senate where there are extremely tight races and the balance is uncertain. But we will mostly be focusing on the Presidential contest since that is the most exciting, easiest to follow and as the executive branch gets more and more powerful every year especially after the Presidencies of Geroge W. Bush and Barack Obama – it is the most important. FULL DISCLOSURE: Unlike “media outlets” which were outright colluding with the DNC I am biased but will be honest about it. I am not voting for either major candidate and my only hope is that there is a split Government so neither Clinton nor Trump have total power. At ~11amET VoteCastr and Slate will start publishing exit polls from key battleground states – The Polls have been dead wrong on calling election results – so it all comes down to Turnout – Base expectations continues to be that Clinton wins the White House, with a slim Democratic majority in the Senate—quite possibly a 50-50 split with the Vice President breaking the tie—and a somewhat smaller Republican majority in the House than the 246 seats they currently hold. Note we will be updating this post throughout the day so please stay tuned for more EXCITING news! Clinton is a 71% favorite in polls-only, 72% in polls-plus – Silver believes that Donald Trump has a better chance of winning the popular vote – that normally would not matter but in this election where many Donald Trump supporters are (rightfully) angry about the state of the country and their finances and many Hillary Clinton supporters do not like or trust her much that could give her a much weaker mandate to govern (at least psychologically?) – I am not sure since unlike pundits I do not claim to be able to predict the future but on that physchological note are you having election stress? What you need to know! See the video below! The man who has shown disregard for many Americans and has openly campaigned for Hillary Clinton and constantly attacked Donald Trump wants you to vote specifically targeting young people who are more likely to vote for Clinton and clearly without stating it outright is clearly telling people to vote for Clinton. Who Will Be The Next U.S. President? Here’s 10 charts and maps that will help prepare your brain for what may come this evening. It’s been a roller coaster over recent months, but the media “consensus” view is that Clinton has the best odds at winning the race. The above chart from Josh Katz plots the chance of a Clinton victory over the last three months according to various publications. As we all saw in June, polling numbers are not to be trusted. Even though the consensus view seems to be a Clinton victory, renowned statistician Nate Silver gives us significantly different odds. According to his website, the chance of a Trump victory is at roughly 28% as we head into Election Day. To stand a chance, Trump has to take Iowa, Ohio, Arizona, Florida, and North Carolina. That would get him to 259 electoral votes. Then he’d need to find 11 votes elsewhere: winning one of Pennsylvania, Michigan, or Virginia would work. However, he has trailed in polls in these three states for months. Trump and Clinton appeal to different groups of people. For Trump to succeed, he will need working class whites to show up in droves at polling stations, and to somehow find cross-over appeal from other voting blocs. Clinton will also need a strong turnout from the growing share of Hispanic voters in the country. This is especially important in states like Arizona, Florida, and New Mexico. Obama’s approval rating is at its highest point in years, and this could end up being a deciding factor in mobilizing enough voters for Clinton. 7. Will voter turnout improve, generally? Voter turnout in the 2012 election was low in comparison to other developed countries. The question is: will it be higher in 2016, and who does this benefit the most? Maybe turnout will be high because of the “lesser evil” vote. After all, these are two of the most disliked candidates in history. By the way, the above numbers are from summer 2016 – before the “lewd conversation” incident, the additional Trump sexual assault accusations, the release of most of the Podesta emails, and the re-opening (and re-closing) of Clinton’s FBI case. No matter who wins, the country will remain very divided over the near future. There will likely be a significant amount of disgruntled people in practically every state. With the hype around the election, one would guess that the respective campaigns of Clinton and Trump would be destined for the record books. The above chart by Max Galka shows normalized campaign finance history since 1960. Clinton spent less than Obama did for either of his campaigns, and Trump was outspent by each of the last four Republican campaigns (Romney, McCain, and G.W. Bush 2x). Clinton lead in Florida (Trump basically needs to win FL or its over), but CO is very tight. Overall, looks better for Clinton right now and you can follow that all day here. Also you can build your own electoral college below and see a video about the Marijuana ballot below – since it could become legal for 25 percent of America could have big ramifications for tobacco, pain drug makers, and criminal reform. 1:15PM EST latest updated – when will the election be over today – please see our video below for more on that. Also, you may have seen this elsewhere but the Mexican Peso is a really good proxy for the election. When Trump is doing well the Peso plummets and when Clinton is leading the Peso soars – the logic is that the market thinks a Trump victory would really hurt the Mexican currency. So where is the Peso now? As of this writing, the Peso is up one percent against the US dollar as the market expects a Clinton victory. Not much more data right now although WaPo says Trump voters are out in force as Clinton’s are also (although Nate Silver has said several times that would likely mean a Clinton victory – Trump’s only chance according to Silver is high turnout among Trump supporters and low or medium for Clinton (or something like that – it is not a direct quote and I do not want Nate to curse me out on Twitter so please read with a grain of salt or whatever)). See below our latest two videos. 1:35PM EST Already there are reports of voting irregularities but this one we can confirm and it is from our very own editor in the great state of Indiana. We will get that story soon but it is pretty outrageous. There have been some scattered issues where voters are encountering problems. Election judges in Clinton Township, Butler County confirmed there were issues with two of their eight automated voting machines. Most of the issues came when people tried to vote straight party ticket. However, other said they specifically wanted to vote for Republican Donald Trump only to see their vote switched before their eyes to Democrat Hillary Clinton. “I went back, pressed Trump again. Three times I did this, so then I called one of the women that were working the polls over. And she said you must be doing it wrong. She did it three times and it defaulted to Hillary every time,” Bobbie Lee Hawranko said. Allegheny County has also been dealing with some Election Day issues. One thing that has me raising questions about all the problems is the fact that Indiana’s online database has changed in the last 30 days. I checked my own registration about a month ago before the deadline to register, and it showed me as registered, but when I went back today, it showed no voter registration record with my name and birthdate in my county. As I started to ask around, I learned that others in my state had registered to vote, but their names were not appearing in the online voter database. I’m hearing that the reason could be that the state “shut down” the online database because the deadline to register to vote was passed. However, the website makes it appear as if you’re not registered even if you are. So either someone made a bad decision to do it this way, or the allegations of voter fraud in Indiana have taken another turn. As it turns out, I was able to successfully cast my ballot. The polling place’s records are different than the online database, apparently. However, anyone who goes to the online database to check whether they are registered to vote may be deterred from going to their polling place because they think that they won’t be able to vote. Lines at some places are quite long, from what I’ve heard, and people who seriously doubt that they will be allowed to cast their ballot may be unlikely to wait to find out. While this problem probably wouldn’t fall under voter fraud, it’s still a concern. 4:25 Updates – exit polls come out soon and we will start to get real data on states come out at 7PM EST (I believe) not much besides market skyrocketing earlier and the peso up which is good for Clinton and she seems to be doing well in Florida which is do or die for Trump so it might be all over if she wins that one state. Below is the latest from Slate’s Votecaster on America’s wackiest state. Also some videos including Jewish aryan Goddess Taylor swift voting. 5:05PM and the first exit polls are out! Some more exit poll data is out and its interesting seems to be mixed – I do not know how to read it even the professional pundits can probably do a better job here – I assume Nate Silver will be the best person to follow on this specific issue – Also, sorry for issues with videos were are posting more below in case the ones above are not appearing. Coverage continues through the night so stay tuned please! 8:30 Remember hanging chads, remember 2000 election, remember Florida man – bring it all together and this election is insane- Florida is literally a few dozen votes apart with the last votes being counted. Florida is literally a must win for Trump while Clinton can afford to lose it. So this is do or die for Trump and it is super close – we might not know the results tonight. 9:05PM wow looks like Donald Trump just won Florida – now onto the other close states – we have a race here! Hillary clinton has won New Mexico. Trump is surging in Ohio. Peso’s fall against the dollar now the highest since the 1994 Tequila Crisis.